As Mr. and Mrs. Darling prepare for an evening out, two of their children, Wendy and John, play their parents. When Mrs. Darling comes in and sees Michael is left out, she gets him in the game and joins in with all of them ("1, 2, 3") while their nursemaid, the dog Nana, watches. Mr. Darling comes in to have his tie tied, and he questions using a dog as a nursemaid, but Mrs. Darling defends her. The previous week, while the children slept, Nana was surprised to see a boy in the room. Before she could catch him, he flew out the window. She did manage to catch his shadow, however, which Mrs. Darling has tucked away in a drawer. Nevertheless, Mr. Darling insists that Nana spend the night downstairs. Mrs. Darling and the children sing a lullaby ("Tender Shepherd"). The children fall asleep. A fairy, Tinker Bell, and Peter Pan fly in through the window. Tinker Bell shows Peter where his shadow is hidden. He tries to reattach it and starts to cry when he can't get it to stick. Wendy wakes up and asks, "Boy, why are you crying?" When he explains, she offers to sew his shadow to his foot. Peter is thrilled when his shadow is reattached ("I've Gotta Crow"). Peter tells Wendy about how he has lived a long time among the fairies, and how one of them dies every time a child says he or she doesn't believe in fairies. Peter tries to introduce Wendy to Tinkerbell (who accidentally got shut in the drawer when Peter found his shadow), but Tink is jealous and won't be polite. Wendy asks where he comes from, and Peter tells her of his island, called Neverland ("Never Never Land"). Peter says he sometimes came to Wendy's window to listen to her mother's stories and tells them to the Lost Boys, forgotten children who end up living in Neverland; Wendy says she'll tell him and the Lost Boys all the stories she knows, if Peter will let her bring Michael and John along, to which Peter agrees. Wendy wakes her brothers up, but suddenly Nana and the housemaid Liza come in, having heard noises. The children pretend to be asleep, while Peter and Tinker Bell hide. 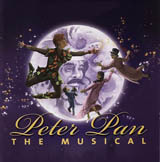 When Nana and Liza leave, Peter invites them all to Neverland, and promises to teach them to fly. They happily agree and ask Peter to show them. Peter happily launches himself into the air ("I'm Flying"). Peter covers the kids in fairy dust and tells them to "think lovely thoughts." Soon the children are flying just like Peter. ("I'm Flying - Reprise") Grabbing some belongings, the children follow Peter, but Michael doubles back when Liza comes into the room, giving her some of his fairy dust and telling her to come to Neverland with them. 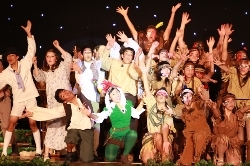 Peter and children fly through the night to Neverland. Peter's "Lost Boys" are standing outside their underground lair, wondering when he will return, when they hear Captain Hook and his pirates ("Pirate Song"). The boys hide; one of them runs into a pirate who chases him, but Hook stops him, trying to keep his men quiet, in fear of an Indian ambush. Hook sends his men to search for all the Boys, and tells Smee, his right-hand man, that he wants to kill Peter most of all, because Peter is the one who cut off his hand and threw it to a crocodile, which has developed a taste for Hook and follows him around, hoping to eat more of him, but luckily ate a clock that ticks and will alert Hook to its presence. Hook accidentally stumbles upon the entrance to the hideout, and summons Smee and his men to provide background music while he plans the Boys' demise ("Hook's Tango"), a rich cake with poisonous icing. Hook suddenly hears a loud tick-tock; the crocodile appears but Hook escapes (actually, Hook faints in Smee's arms and Smee drags the captain away). The pirates flee, and the Boys reappear, thinking they're safe. Suddenly, a group of "Indians" appears, led by Tiger Lily ("Indians"). They leave the Boys alone, and go on hunting the pirates. However, Tootles accidentally bumps into an Indian who grabs him and tries to carry him off. The Boys and the Indians have a tug-of-war over Tootles, but everyone stops when the Boys see a strange bird in the sky, and one of the Boys fires an arrow (the Indians run away in fear). It isn't a bird; it's Wendy! Peter, Michael and John land to find the arrow lodged in her heart. She isn't dead, but she can't be moved into the hideout, so the Lost Boys build a house around her, hoping that she'll agree to be their mother ("Wendy"), to which, when she wakes up, she agrees. Hook plants the cake, but Wendy thinks it too rich; instead, she'll tell the Boys stories. Hook is infuriated that the Boys have found a mother. He plots to kidnap Wendy and the Boys, while Smee and the pirates play a "Tarantella". After the pirates leave for their ship, Liza arrives and does a ballet with the trees while Peter sleeps outside the house. A few days pass with everyone having adventures. One day in the forest, after Peter leads the Boys in their anthem ("I Won't Grow Up"), they almost run into the pirates, who arrive with a pirate carrying a bound-and-gagged Tiger Lily over his shoulder and ties her to a tree for the wolves. Peter throws his voice in mimicry of the Captain and convinces the men to let her go. Hook arrives and becomes enraged at the news of her release. He demands that the "spirit of the forest" speak to him, so Peter tricks them all to think he is Hook, and the real Hook is a codfish. The pirates abandon Hook, but Hook convinces the "spirit" to reveal its true identity. Peter obliges, disguising himself as a "beautiful lady" ("Oh, My Mysterious Lady"). Hook catches on and tries to ambush Peter (and the pirates rejoin), but the pirates are chased away by Tiger Lily and her Indians. Back at the hideout, Tiger Lily and the Indians rush in, and are almost shot by the Boys, until Peter reveals the truce between them. They smoke a peace pipe and vow eternal friendship ("Ugg-a-Wugg"). Tiger Lily and her Indians leave to stand guard around the house above. Wendy asks Peter to sing the Boys a lullaby ("Distant Melody"). Michael and John want to return home, and Wendy admits to being homesick, too. The Boys wish they had parents, and Wendy offers hers to all of them. Everyone is excited about being adopted, except Peter, who says he won't go. Wendy tells him she'll come back once a year to do his spring cleaning. The pirates attack and subdue the Indians. They give Peter a fake all-clear signal, so Peter sadly sends Wendy, her brothers, and the Lost Boys on their way. Before she leaves, Wendy sets out Peter's "medicine" for him to take before bed. As the they leave the underground house, each boy is gagged with a white cloth shoved into their mouth and carried over the shoulder of a pirate to Hook's ship, the Jolly Roger, where the Boys will be made to walk the plank, and Wendy will be forced to become the pirates' mother. Once the boys and Wendy are carried off, Hook sneaks into the lair and poisons Peter's medicine. Tinker Bell tells Peter of the ambush and tries to tell of the poison, but he waves her off as he prepares for a rescue. Desperate, she drinks the poison herself. Dying, she tells Peter that if every boy and girl who believes in fairies would clap their hands, she would live. Peter breaks the fourth wall and asks children of all ages to believe and clap their hands. They do, and Tinker Bell is saved. Peter grabs his sword and heads off to rescue Wendy and the Boys. Hook revels in his success as the pirates fight over the Boys' possessions while they tie up and gag the boys ("Hook's Waltz"). Hook breaks the fourth wall himself and tells how he hates that children are made to hate him and love Peter. As the plank is prepared, Hook hears the tick-tock of the crocodile and panics. It's actually Peter with a clock, and while Hook cowers, Peter and the Boys help the Indians, the animals and Liza onto the ship and hide. Peter hides in a closet and kills two pirates Hook sends in (Hook calls Peter the "doodle-doo" as he still crows after killing the pirates). The pirates then carry the Boys in, and the Boys pretend to be afraid as they are carried in. Peter disguises himself as a pirate, and the pirates think the "doodle-doo" killed all the Boys. Hook believes the ship is now cursed, and everyone thinks Wendy is the source. The pirates push Wendy to the plank. Peter ditches his disguise, and the Indians and animals attack, as well as the Boys who are alive and armed. The pirates are all defeated, and Peter challenges Hook to a duel to the death, and defeats him. Hook threatens to blow the ship with a bomb, but runs into the real crocodile (who Peter also brought on the ship). Peter catches the dropped bomb and tosses it in the sea after Hook slides down the plank (which is shaped like a slide) with the crocodile chasing behind him. Everyone sings Peter's praises ("I've Gotta Crow" (reprise)). Before the Darling children and everyone goes to London, Liza asks Peter to teach her to crow ("I Gotta Crow - 2nd reprise"). Back home, the Darlings sit by the nursery window night after night, hoping for their children to return. The children silently reappear and sing to their mother ("Tender Shepherd" reprise). Joyous over their return, the Darlings happily agree to adopt the Lost Boys ("We Will Grow Up"). Wendy prays to the window that Peter will return to her.